This volume provides the first English translation of Hans Kelsen's and Carl Schmitt's influential Weimar-era debate on constitutional guardianship and the legitimacy of constitutional review. It includes Kelsen's seminal piece, 'The Nature and Development of Constitutional Adjudication', as well as key extracts from the 'Guardian of the Constitution' which present Schmitt's argument against constitutional review. 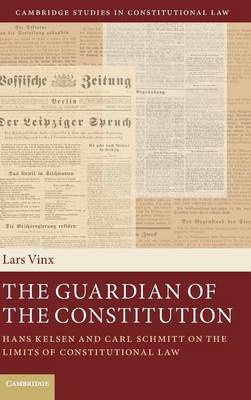 Also included are Kelsen's review of Schmitt's 'Guardian of the Constitution', as well as some further material by Kelsen and Schmitt on presidential dictatorship under Article 48 of the Weimar Constitution. These texts show Kelsen and Schmitt responding to one another, in the context of a debate focused on a concrete constitutional crisis, thus allowing the reader to assess the plausibility of Kelsen's and Schmitt's legal and constitutional theories.